The Suite came with a standard 12V deep-cycle battery, 110–>12Volt Converter and one 21 Watt Solar panel installed. It was supposed to have 2 x 21 solar panels installed but due to a miscommunication between office and shop they said it couldn’t be done. After some discussion it turned out that it could and should have been done but by that time I was at home. ProLite sent me the panel and I installed it myself. Turned out to be quite easy. After out first real trip I knew I wanted more power capacity. I actually knew that beforehand but decided to do the first trip stock. I wanted as much off-grid capacity as would be feasible. Primary usage was to keep food cold. For that I decided to install the Engel fridge as it had a pretty low power requirement at 2.3 amps or less. For entertainment we have a 12 Volt Stereo and TV permanently installed. I ultimately added another 21 watt panel and a 7 watt. 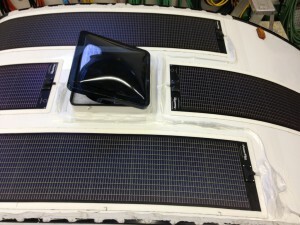 All the solar panels are PowerFilm Rollable’s purchased from Go Solar RVing Inc. The panels are Butyl backed for permanent installation. The solar panels are connected in parallel to the MPPT controller. The single deep-cycle battery was replaced with 2×6 Volt AGM batteries to give me a capacity of 225 AH. For off-grid 110 Volt power I installed a 1000 watt Xantrex Inverter with an auto switch-over so that the load plugged into the Xantrex will go hydro when trailer is plugged into shore power. The Engel fridge will be travelling in the back of the tow vehicle with provisions to pull power from the tow vehicle when engine is running and from trailer when not. Provisions are also in place to power the fridge from shore power directly. The 12 Volt source is low voltage protected so that power is turned off at approximately 11.7 Volts so as to avoid damaging the fridge.